Michela Zandonai rated &apos;very good&apos;. 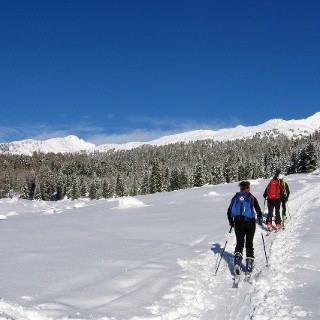 The most popular tour in the Lagorai mountains! Recommended especially after snowfall. In dangerous conditions you can reach the top by making a wide turn westwards to the area “Buse dell’Oro”. From there on the beautiful upper slopes, moving left, you reach once more the former track and the summit. Ascent: proceed along the forest road until to the second junction. There take the trail to the left following the valley bottom-gully (south: way mark: Ex Malga and Colbricon lake) leading below “Malga Colbricon”. Now climb the open slope to your right (avalanche slope). Keep going along the edge of the forest till you hit a good visible trail. Follow for a short distance to the right. Then turn left and climb the steep hill between large sparse trees until you reach with gradient variations the open summit slopes. Keep going southwards close the ridge to the top. From Predazzo drive on SS 50 direction Passo Rolle. Pass location Paneveggio and after the first big turn, park on the right side (15 km from Predazzo).